By now, you’ve seen ninjas of all ages shredding gnar on YouTube. Right? They make indoor skydiving look easy. Spoiler: it’s anything but easy. If you’re wondering how long it takes to get to that level, we’re going to see your question and raise you a few pro tips. Ready? Let’s get into it. 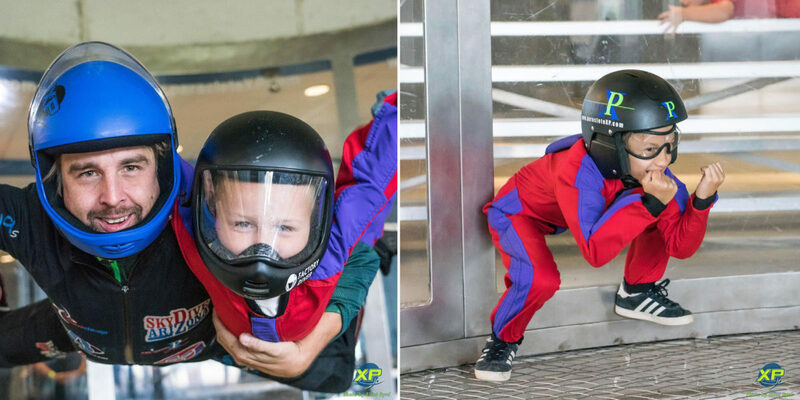 Okay, most of us reading this article are at least a little bit past middle school at this point, but listen up: to get really good in the tunnel, starting a flying career before you hit a double-digit age really helps, so bring the kids! 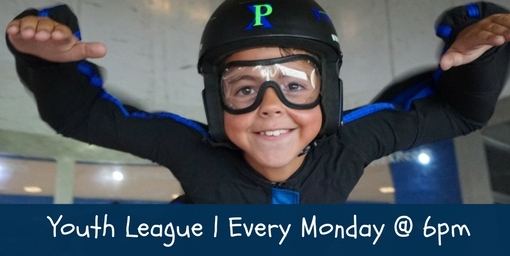 Some of our strongest flyers at Paraclete XP started flying in the tunnel when they were pretty darn wee, and now they’re pretty darned amazing. Juicy young neurons pick this stuff up fast! Even if you’ve been skydiving for a long time, you’re going to take the same path of progression in the vertical “indoor skydiving” wind tunnel as everybody else has: from belly to back to sit to head-down to zoomy dynamic flying (which revolves around the fluid transitions and multi-directional configurations that make wind tunnel flying so riveting a watch). Most new tunnel fliers want to move through the progression as quickly as possible, but take it from us (and everybody else who’s ever gotten good): respecting the progression is the only way forward. In the tunnel, there’s very little room for error, and every detail counts. People come to the tunnel for very different reasons and fall in love with different disciplines along the way. Some love to work together as a team on a relative discipline; some enjoy the chance to freestyle it up as a solo flyer; still others are dead set on developing the body positions that we use in “airplane freefall.” Try it all, and find what you love! There’s plenty to choose from. If you really want to be a gnar-shredder, you’re going to need to spend a lot of time in there. Get mentorship from one of the eminently experienced wind tunnel coaches here at Paraclete XP. Most tunnel flying coaches suggest flying at least once a week to progress meaningfully and to keep your skills nice and sharp; with great coaching, that time will be bookended by pithy instruction. If you want to progress your skills in the tunnel, the single most important step you can take–and everybody will tell you this!–is to relax. Of course, that’s unbelievably counterintuitive at the start. Frankly, at first, relaxing won’t feel remotely possible. You’re certainly not the only flyer struggling with it. Everyone starts out carrying a lot of muscle tension. That’s just part of the sport! The magic comes sooner or later, and you’ll feel it: one day, you’ll relax into the arms of the wind and you’ll suddenly feel the smoothness and efficiency that comes with it. Until then, trust the process! To learn to fly in the vertical wind tunnel is challenging. It’s important to remind yourself, with every new attempt, to smile. The more you’re able to keep the corners of your mouth turned upwards, the faster your skills in the tunnel will progress. And we’ll be smiling with you! There’s no time better than NOW to get started. Book your first experience today.